This is the first in a series of three SACDs devoted to music which Bach either wrote originally for oboe and/or which is usually accepted as appropriate for that instrument; or has been specifically so arranged. Volume 2 (CM0032003) and volume 3 (CM0012004) have been reviewed on Classical Net in recent months – generally favorably. Caro Mitis specializes in recordings of high sound quality (only SACDs are usually available in their catalog) featuring specific repertoire, rather than themes, or "star" performers. Hence the logic of recording over three disks a body of music with its own character and place in the Bach canon. It works well; the music is appealing, appealingly arranged and well performed – by the Moscow chamber group, Hermitage. Founded in 2000, it's probably the only such ensemble directed by an oboist. Their playing is inspiring and more than competent. Although this means that Hermitage has – or chooses – to specialize in transcriptions of other works for oboe – as here, good arguments can be made out for that format in the cases of the four concerti presented here. Although the title of the disk, "Works for Oboe" will, for some, remain open to debate. BWVs 1053, 1055, 1060 and 1064 all date from Bach's period at Köthen (1717-1723) where they form the originals of concerti which resurfaced in the 1730s for the keyboard. You'll certainly recognize them. 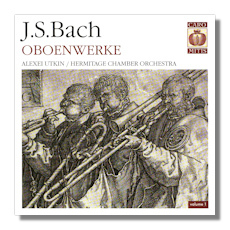 The premise of this release (indeed of the three volume series) is that, given Bach's sensitivity to the qualities of the instruments for which he wrote, it can be safely deduced that these were originally written for the oboe. The full, resonant, expressive sound; the intonation of the sweet and "affectionate" woodwind instrument (the oboe is the only instrument to have the appendage, "love"… "oboe d'amore" – often used in Bach's choral and vocal music when the theme is love); and its tessitura all help to make the claim that these concerti were originally conceived for that instrument. They're certainly persuasively played by Hermitage's dynamic director, Alexei Utkin. He brings to the performances a precision and tight focus that only enhances the sense that these were works which Bach prized highly. Charged yet unsensational, fluid yet not floppy, and articulate without being rhetorical, each movement adds in impact and color to the last. It can also be assumed that when Bach wrote for the oboe, if not actually experimenting (which at times he most definitely was), he was exploring an instrument for which timbre and sound profile were as important as an ability to produce a "colorless" melody. It may also be conjectured that as Bach grew older, he became more interested in melody and structure (for their own sake) than in texture. Hence the later reworking for keyboard of the pieces here. If those are sustainable thoughts, then the greater the credit to Utkin and Hermitage for not over-painting, over-coloring – and definitely not varnishing – music whose tone and harmony, structure and tunefulness are certainly quite sufficient on their own. The approach of these musicians is un-selfconscious and purposeful. The music is played as they contend it was originally written. Without undue excitement, yet full of vigor and life. The acoustic (the recording was made in the studios of the Russian Television and Radio Broadcasting Company) is lucid and full – just right to add atmosphere (but little more) to the exuberance and melancholy of the music. Mercifully, the booklet that comes with this first in the series is much better written than those of the later two. Whilst still a little florid in places, it achieves its purpose of truly informing the listener about the provenance and nature of the music. If you have (either of) the other two releases in this series, you'll want to complete the collection. If you simply love Bach, it will appeal because both of its interest musicologically and of its technical accomplishment. Needless to say, (Baroque) woodwind enthusiasts will find much in this volume and this series to delight.